I have a morbid fear that if something bad were to happen to me, no one in my circle of friends and family would find out for days – or weeks – at a time. Mind you, this is all under the presumption that my cell phone would still be on my person or found in my home. I have my doubts that my phone would be accessible but since this is my macabre fantasy, let’s just go with the idea that something has happened to me and the police or a hospital worker has to look through my cell. Simple, right? They’re not only my favorite people but they are related to me in some way, shape or form, and the simple lack of last names lets us know they must be Very Important Peeps in my life. First and last names make it easier in an emergency but I also have the added benefit of always knowing how to spell my friends’ names. (You’d be surprised how many people don’t know how to spell a friend’s name…..or know their birthday, which baffles me. I think that’s more of a guy thing, though.) I hate not knowing how to spell someone’s name or worse yet, forgetting what someone’s last name actually is. In essence, this is another way I celebrate practicality but also help the imaginary people who would be assisting my family in some kind of Zoe-related emergency. Aren’t I ever so helpful? Now that you’re getting a better sense of how deep this rabbit hole is, tell me: how do you label people in your phone? Do you get really wacky or are you no-nonsense like me? The only exceptions to the full name rule are my Mom (“Mom”), the vet (labeled “Dr. King”), Aunt Therese, and the landlord (“Landlord”). And your dad, too, I think. We are Practical(ly) Twins. Get it? I’m pretty straight forward… Mum, Dad, then everyone else by name. My issue isn’t what happens if I land in hospital and my family don’t even know… mine is, that my family know, but they can’t do anything about putting my etsy store on vacation and letting my etsy friends know something has happened to me. I keep meaning to write down the instructions, 1. email a particular friend and tell them the situation. 2. type in this address, code word, and set store to vacation by doing blah, blah, blah…. I know I have to do this, and yet the days keep on passing me by with nothing prepared. I am having surgery later this year though so hopefully by then I will get off my backside and do it. Good idea to have a backup plan for that! I’ve always wondered what I would do about my blog and whatnot, as well. I hope your surgery will go safely and smoothly, as well. 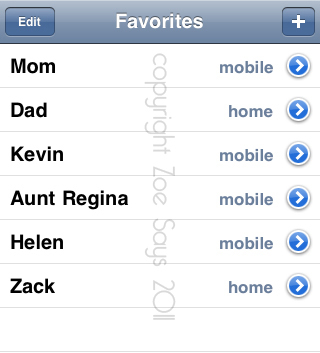 I’m a little OCD about these things so, ok, the names of my immediate family are preceded with the letter ”A – ” (e.g., A – Mommy) so their names are always first when someone scrolls down the contact list, work colleagues have ”Ofc -”, close friends are under ”z -”, high school classmates are ”HS”, etc. That’s definitely a different way of doing things but I think it’s rather creative, especially if it works for you! Scott, I have the same thing with my pass code and then the erasure but I was taking several liberties with this post, obviously. So interesting that you put your parents as first and last name! I actually kind of wondered, knowing how particular you are about stuff like that. If I don’t list doctors with some kind of notation on who they are, I’ll forget. A partial reason for having my parent’s full name is that I feel somewhat infantile having “mom” or “mommy” or some variation on my phone. Also, not calling my stepfather “dad”, I don’t like having just a first name. Those names are usually people I’ve randomly met and don’t know well. So it’s odd for that listing “type” to be my father. As for the doctors, I know exactly who they are (unfortunately), so the only notations I make for someone is if they’re a business contact I don’t use often (handy man, parking garage, etc). Totally with you on this one…I am a no nonsense namer when it comes to my phone. But that makes sense. And that’s super informative if someone is deciding whether or not to call that person in an emergency! I toooootally think like this too! I left my phone in a cab one night a few years ago, I freaked out and even called 311 from a subway station – pay phone in a NYC subway?! EW. It turned out that the cabbie found “Home” on my phone and called it much to my parents’ surprise (I’d already moved out of their place by then but I still refer to their landline as Home, haha). But it did the trick, and I got my phone back! You’re right, calling from a subway pay phone would really freak me out. Gross! I’m so glad the cabbie was honest and called a Home number so you got your phone back. That’s awesome!